WiFi is a very important function to RV travel. This Park had no WiFi in my area yet advertised the have it. They refused to make any concessions when I brought this to their attention i.e. move spots or discount. The answer I got was “There is nothing I can do for you.” I won’t be back here. While we have been to Fredericksburg over the years many times before we started traveling in our RV, this is the first stay at this park. The experience was GREAT. The staff were cheerful and helpful. All the sites are pull-through and basically ours was level and VERY clean and trim. The electric, water and sewer hook-ups were nicely placed and well maintained. The trees were healthy and nice didn't interfere with our C-Class slide. The cable and WIFI worked as promised. The sites are nicely sized, but you're fairly close to your neighbors. The park was at capacity, but it was not noisy at all. Fredericksburg and this area have such a wide variety of activities and attractions (this time the Food/Wine Festival brought us) and now that we've found this wonderful Park we'll have the perfect home-base for seeing and experiencing it all. 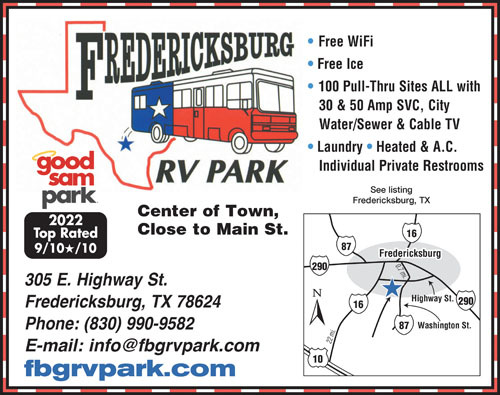 I'm not sure how the other parks in the area fare (I'm sure that they have their own charm), but I highly recommend the Fredericksburg RV Park ... It was really nice!! The people working the office at Fredericksburg RV Park were very nice and helpful. However, some of the people who are residents were very rude- especially a couple we met in the laundry. We felt as if we were invading their home! The park is close to the town of Fredericksburg but it is not "walkable". There are no sidewalks along the road. The drive into town takes only a few minutes and it's well worth the trip. The George H. W. Bush Museum of the War in the Pacific is well worth your time and admission fee. If you are a student of history you will be amazed. WalMart and H-E-B grocery store is close by as well. If you have dogs, don't even bother stopping here. The places to "walk" your dogs are filled with Sticker plants. My dogs did not even want to go outside. Every time we went for a walk they each ended up with at least 5 stickers in their pads. Don't be fooled by the brochure that shows a "dog park". It is very small and filled with stickers. The edges of the park are no better. We found that the best place to walk our dogs was a storm gully because it had fewer stickers. There really must be something that can be done to kill the plants before they emerge. There were several permanent sites where the people living there planted grass so it can be done. In short, nice place if you don't have dogs! Great park in a great area. Super nice staff and a very tidy park. Fredericksburg is a fun town with a lot to do. It depends on what you are looking for. This park is well kept and does have some shade trees. Sites are gravel and are fairly level. Lots and lots of noise from businesses next door. Refrigerated trailers start up every 15 to 20 minutes and run for 7 to 8 minutes 24/7. We found this to be very annoying. Warning NO REFUNDS so if noise bothers you I wouldn't suggest this park. It is way way over priced at $300 per week. Lots of nice places nearby that are a lot cheaper. Absolutely no amenities at all other than a TV in the rec hall and an indoor shuffleboard table which they covered (without a word) as we were debating whether or not to play. Ok for a one night stay but we would never stay here again for a longer period. We stayed at Fredericksburg RV Park in a 5th wheel, pull-thru site. The park was very clean, quiet, with lots of trees and friendly staff. The WiFi was reception was not good, but since we are retired, it wasn't that important to us. Would stay here again. 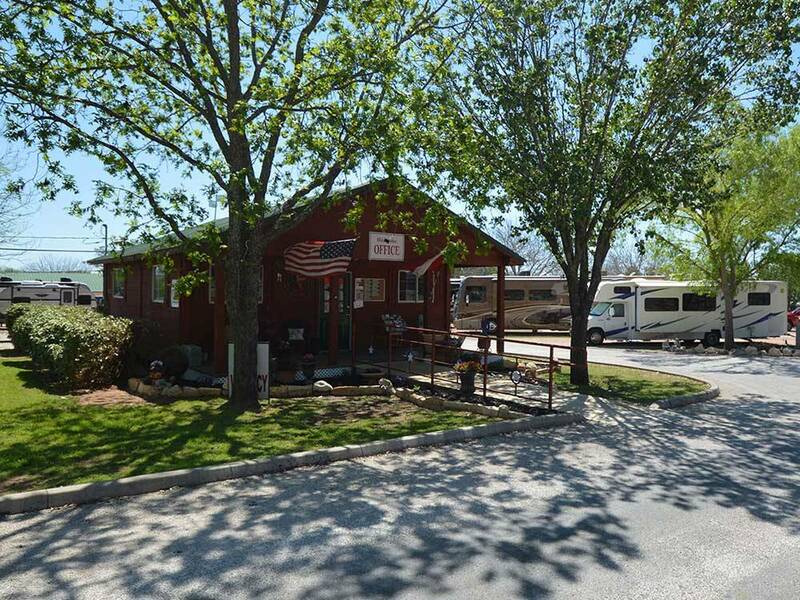 Private RV park in Fredericksburg, minutes from downtown. There is a lot to see and do nearby. The Admiral Nimitz and the National Museum of the Pacific War is outstanding. Overall the RV park is in good condition, all the sites are pull-throughs. Gravel roads and pads (with picnic table). Good WIFI and cable. Rest rooms, showers, and laundry were clean and roomy. Seems a popular spot for snow birds. Would return. Very nice park that we'll maintained. Close to downtown area. Really enjoyed the Nimitz and WWII war in the Pacific museums.Very quiet. Spaces are nice sized with picnic tables and hookups placed in the center. Lots of shade trees. Would rate a 5 if pads were concrete instead of fine crushed rock. Would recommend to anyone not interested in pool and playground. Arrived intending just to stop for one night and ended up staying 5 nights. Nice, clean, quiet RV park that is located in a town with lots of worthwhile sights to see. Loved the level sites, best WiFi and cable that we have had on a cross country trip and easy location for day trips to San Antonio, LBJ ranch and even Luckenbach. If you go, check out the Pacific War Museum in Fredericksburg. High quality museum for sure. This park is a hidden gem, would definitely return.